It has been four years since JGIM published a themed edition in medical education, and on behalf of the entire JGIM editorial team, we are pleased to present the 2019 Medical Education Theme Issue. The quality and breadth of research, innovations, and ideas in medical education are truly impressive. We received over 230 submissions with space for just 20 manuscripts in the Theme Issue. 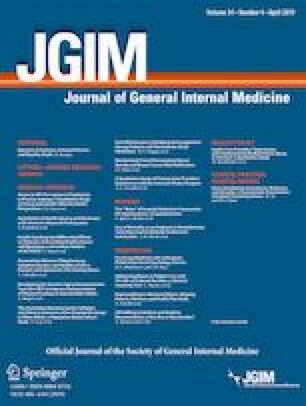 The process was challenging and many quality manuscripts focusing on important topics like mentorship, faculty development, professional identity formation, and curricular innovations that could not fit into the Theme Issue are included in upcoming regular issues of JGIM. The manuscripts in the Theme Issue represent the full spectrum of medical education from institutions across the USA and Canada authored by medical students, physicians, and senior educators. Manuscripts include quantitative and qualitative original research, perspectives, innovations, as well as narrative, scoping, and systemic reviews. Five major themes arose from the manuscripts: Health Systems and Educational Structure, Social Determinants of Health and Health Disparities, Well-Being, Bias, and Assessments. Each major theme is discussed with an accompanying editorial. Rather than further classifying the manuscripts by purpose, we instead looked for how individual manuscripts within a theme and between themes fit together. Ideally, each manuscript can help inform and influence the reader’s thoughts on each subsequent manuscript in the same way that individual data points can combine to develop an illness script…—the whole becomes more than the sum of its parts. One of these central threads deals with the complexity of our current health care system and the ways in which medical education interacts with this system. Pincavage et al.1 provide a window into the complexity of the internal medicine clerkship and some of the challenges experienced by medical educators. The recent changes announced by CMS regarding medical student documentation in patient records have put a spotlight on this complex and often fractious relationship between the health system and medical education. Wallach et al.2 provide important context to how medical students are utilizing the electronic health record and raise key questions about training and residency preparedness. As we move more towards competency-based, objectively measured outcomes in medical education, Stratton et al.3 warn that even the best intentioned, learner-centered curriculum may be subsumed by organizationally centered forces, and that we should not lose the educational value of an activity in the quest to find measurable outcomes valued by the health system. The implication is that not all measurable outcomes are of value, and that some outcomes not measurable are actually valuable. Following on this cautionary tale and turning to the topic of assessment, Hatala et al.4 remind us that the origins of learner entrustment are actually based on procedures and warn against conflating the terms “trust” and “entrustment.” Of note, the applicability of entrustment may not be entirely compatible with many of the activities in which internal medicine trainees engage, and there may be particular problems relying on numeric scales for entrustment. These clarifications will be increasingly more important to understand as we move entrustment concepts into the world of undergraduate medical education. Karp et al.5 provide some insight regarding medical student perceptions on entrustment, finding learners at this level of training are at risk of being “over trusted” or “under trusted”, which can lead to feelings of anxiety and frustration. Concerns over the impact of entrustment on evaluations further complicate learners’ willingness to engage in entrustment discussions. Grades are the ubiquitous backdrop for learners, and the ability for educators to fairly assess and evaluate learners in an increasingly competency-based environment is critical. Frank et al.6 investigate the impact of clerkship grading committees on grades and find some positive impacts regarding fairness and bias, although determining the relative value of numeric and narrative data on learners remains an area of difficulty. Bias in assessments has been a growing concern for educators across the spectrum of medical education. Klein et al.7 present an important review of the assessment literature demonstrating the complex manifestation of gender bias in residency assessments despite the implementation of competency-based evaluations. Gender-based normative behaviors and expectations may be an important factor driving this bias. Rojek et al.8 provide further insight from the medical student perspective identifying gender-based differences in the narrative language on assessments. Female learners were more likely to be characterized by personal attributes while male learners were more likely to be characterized by competency-based language. This implicit bias stemming from traditional gender roles may have significant impacts on evaluations and perhaps even career opportunities. Implicit bias is an increasingly important topic in medical education and is beginning to be introduced into the curriculum in a more meaningful way. However, as Gonzalez et al.9 explain, there are significant barriers to students accepting this curriculum. Learners report concerns over being “shamed” by discovering or admitting to implicit bias and report the hidden curriculum often re-enforces the stereotypes created by implicit bias. Providing a safe learning environment for learners to express concerns or conflicting ideas may be an important first step in the success of this new curriculum. A better grasp of implicit bias is often seen as a pathway to understanding how health disparities in medicine can occur and persist in at risk populations. As McDermott et al.10 describe, medical students have the ability to positively impact patient care and the health system when allowed to experience and understand these health disparities first hand. Not to be lost in the increasingly complex nexus of health systems and medical education is the learner, who is trying to balance academic, personal, and professional responsibilities while navigating the transition from student to clerk to resident. Learner well-being has been an important topic for many years, but Zabar et al.11 provide a sobering reminder that although learners are almost universally empathic towards a struggling colleague, less than one-third think to screen for depression in their colleagues or direct them towards appropriate resources to provide assistance. Activities that raise awareness in learners as well as pro-active programs to assess wellness may have a positive impact on the health of learners in medical education. Our medical education structure is intrinsically bound to a health system influenced in powerful ways that are both explicitly measurable and implicitly implicated. We will need to be vigilant in our efforts to better understand these influences and empower our learners with the knowledge, skills, and attitudes to positively impact patient care and the health system in which they will practice while maintaining the balance crucial for personal health and well-being. In writing this, we are reminded of a mentor’s advice, “embrace complexity and act with simplicity”. We hope this Medical Education Theme Issue is more than just a collection of individual high-quality manuscripts and functions as a catalyst for future discussion, research, and innovation. We gratefully acknowledge the unending and gracious support of Carol Bates, Steven Asch, Jeffrey Jackson, Rachel Roberts, Emily Fox, and the rest of the JGIM staff. We also would like to express our immense gratitude to our Deputy Editors Michael Elnicki, Reena Karani, Darcy Reed, Shalani Reddy, and Donna Windish, and Guest Editors Dodd Denton, Paul Hemmer, Klara Papp, Eric Young, and Bridget O’Brien, who labored through a mountain of submitted manuscripts ushering them to completion. We are humbled by the hard work of all the authors who submitted their high-quality, well-written original research, innovations, and perspectives for this special issue, and acknowledge we could not include all of these well-deserving manuscripts. The opinions expressed by the authors are their own, and do not necessarily reflect the position of JGIM or their respective institutions. The authors have no conflicts of interest to report.